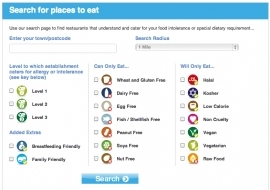 The awkwardeaters.com search function has been created to allow users to find places to eat that will cater for their food intolerance or special dietary requirement. The search page has been designed with simplicity in mind. All you have to do is enter your location and state the radius from that location in which you wish to search. It’s then a case of stating which foods you “Can Only Eat” and “Will Only Eat” and the “Level” of service you require. 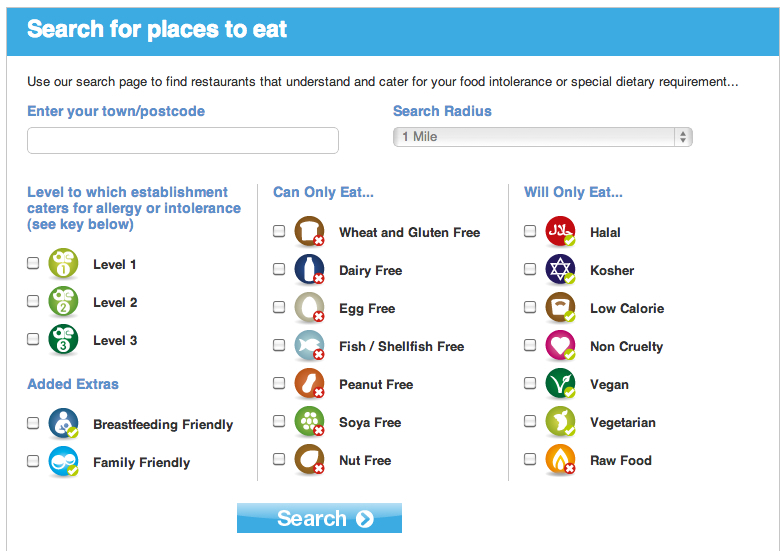 The food symbols correspond to the relevant intolerance or requirement and are used throughout the website. Finally, hit the big ‘Search’ button to view your matching results. We have categorised the restaurants featured on awkwardeaters.com into three distinct levels of service. We have done this because although many restaurants now for Awkward Eaters, the extent to which they provide this service varies. When the restaurants on the website agree to be featured they let us know which “level” of service they can provide and we list them accordingly. Level 1 – The least you can expect on this site! Level 1 is for establishments where food and menu choices are available that cater for some basic dietary requirements, e.g. Gluten Free options are marked on the menu. Level 2 – A higher level of service for Awkward Eaters. Level 2 is for establishments that in addition to providing to Level 1 standards, will also adapt their food and menu choices to meet some dietary needs, e.g. will use a dairy free alternative to butter, milk and cream when making dishes or will replace animal products to make dishes suitable for vegans. Level 3 – For the more demanding Awkward Eaters! Level 3 establishments welcome and are able to cater specially for a range of intolerances and dietary requirements. From the results page you can select to look at individual restaurant’s in greater detail. The restaurants’ contact details, map of location and a brief written exerpt from the restaurant are then displayed. Links to any social media from the establishment are also displayed. Underneath the individual restaurant is the Disqus comments feature. Here you can leave a comment letting the rest of the awkwardeater.com community know what you thought of the establishment and your overall dining experience. We’d like to encourage you to use this facility in order for awkwardeaters.com to truly become an engaged community platform. We have tried to make our ‘search’ facility as useful as possible to our awkward eater users. However, if you have any suggestions as to how we can improve (i.e. any “Can Only Eats” or “Will Only Eats” you would like us to add) then please don’t hesitate to let us know. Similarly, if you are a restaurant and would like to feature on the site then we would love to hear from you. Our list of restaurants featured is a work in progress and will be developed as the website moves forward. As the awkwardeaters.com are based in London, this is where we will primarily be focussing in the first instance, but it is our intention to rapidly move further afield. We will use Twitter and Facebook to keep followers up to date with additional areas of the country that we cover. Although we will do our utmost to accurately represent the services you can expect from an establishment we are not responsible for your experience there. Restaurant services and details are subject to changes beyond our control and you should always check ahead with an establishment to ensure your dietary requirement or food intolerance will be met. Care and caution should always be taken when dining out and if you have a food allergy medical attention sought if needed.